THE DEVIL'S ENGINE: HELLWALKERS is the final book in the Devils Engine trilogy, and we're excited to have Alexander Gordon Smith join us to share more about it. Alexander, what's your favorite thing about THE DEVIL'S ENGINE: HELLWALKERS? The last book in a series is always the hardest one to write. You’ve been through so much with your characters, you’re literally about to walk through hell with them. These people are your friends, your family, and you know you’re about to go on one final adventure with them, and that not all of you are going to make it out alive, with your soul intact. Stepping into Hellwalkers felt just like this. Before I started writing, I felt like I was standing with Pan and Marlow and Charlie and Truck and Night and Herc looking toward the horizon and knowing that we’re about to do something amazing, something terrifying, something that will change us forever. I felt like we hugged each other tight, then just started running. And we don’t stop, we just don’t stop running, through fire and brimstone, through the smoke and the stench and the screams. This book is a non-stop roller coaster ride through the horrors of hell, but at its heart it’s about these amazing characters standing shoulder to shoulder with each other to try to save the world. In the depths of hell, we find our humanity. It’s a blast!! The ending of Hellwalkers was so difficult to write, and I ended up actually rewriting the whole last act. The first ending was a real tear-jerker, the second was much more action packed and true to the spirit of the series. But in a way, both endings are right. This is a series that messes with time, with space, with dimensions and universes and even with the worlds I created in my other books. In a series where there are an infinite number of parallel realities, it makes sense that there is more than one ending. I’ll probably post the alternative ending on my Wattpad one of these days so readers can make their own minds up! How long did you work on THE DEVIL'S ENGINE: HELLWALKERS? I think it took about three months to write Hellwalkers. The truth is I can’t remember! That’s the weird thing about writing, you end up living on book time. I don’t remember much about my life when I was writing this book, but I remember everything that happened in the story as if I was living it: the sights, the smells, the emotions. I couldn’t tell you a single meal I ate during those three months, but I can tell you exactly what a demon’s exploded guts smell like… And in a way, I’ve been working on this book my whole life, ever since I started telling stories. Our books are a cumulation of all the experiences we have ever had, and I think this one has been brewing inside my head since I was a kid. It taught me that your characters are very real, very powerful parts of yourself, and that if you want your writing to succeed then you have to trust them. They share so much of your mind, but they also carry their own lives with them, their own loves and needs and fears and failures. We carry an infinite number of characters inside us when we write, sometimes it can be overwhelming when they all start acting like they want to do their own thing. But it’s only when we let them do their own thing that suddenly the story feels real. Give them the reins, see what happens, trust them. What do you hope readers will take away from THE DEVIL'S ENGINE: HELLWALKERS? I want readers to take away hope. I’ve said it a million times, and I still believe it with all my heart: hope is the most important thing in the universe, in any of the universes, and especially in hell. This book deals with a particular kind of hell, but I think we all experience our own personal hells throughout our lives—losses, deaths, illnesses, demons of all shapes and sizes. Hell is something different for everyone. I would love for readers to get to the end of this series along with the characters, and then understand that they too have the strength to make it through hell, and to come out the other side. That’s what horror is, for me. It’s a way of finding your own courage, it’s a way of understanding that you can be a hero too, even if your heroism is just facing up to your own life. We are all Hellwalkers, but we all have what it takes to break out. When I was 18 I wrote my first full-length novel. It was called Asylum, and it was set in a prison called the Furnace Penitentiary (which may sound familiar to some readers!!). It was a horrible, gratuitously violent horror novel for adults, where angels would travel through to our plane of existence and eat people. I sent it to three publishers when I’d finished it, and all three rejected it. And I did the stupidest thing I could do, I gave up. I stopped writing for seven years. Luckily I realised how stupid I’d been. It suddenly clicked one day, that nothing you do as a writer, nothing you write, is a waste of time. All those stories you start and don’t finish when you’re a teenager, all those rejections, they’re just part of the process, they’re the foundations of your future career. They’re the building blocks of the books you write when you’re older. It might not seem like it when you’re young, or just starting out, or reading over that rejection slip, but the story you’ve just written is essential because you learned something when you wrote it, you’re now a better writer than you were before. Treasure these moments, even though they’re frustrating, because these are what make you a writer. Just keep writing. That was my ah-ha moment, seven years after my biggest failure. I started writing a new novel, for kids, and that was the one that got published. Hellwalkers taught me so much about characters, about where they come from and how vital it is to make them feel real—to your readers, yes, but to you most of all. I never plan my books, but I try to learn everything I can about my characters. Their favourite foods, the way they dance when nobody is watching, their relationship with their pet hamster, their biggest regret, the way they eat their breakfast cereal. Everything! Take some time before you start writing and interrogate your characters. Google Proust’s questionnaire and ask them all the questions there. Their answers, and the way they answer, will tell you everything you need to know about how they would behave in the story. And that’s key, because you want them to act according to their background, not yours. Finding out who these people are is the best way of making your stories comes to life. And look for something in your own life to share with your characters. An experience, maybe, or an emotion. When I was eleven I tried to spend a night inside a haunted house so that I could write the most terrifying story ever told. I lasted seven minutes before exploding out of the door throwing up all over myself. True story! I almost gave up writing then, too, because I didn’t think I was brave enough to be a horror writer. But I just kept getting drawn back to those seven minutes, and writing stories about them, and it suddenly clicked: writing is about finding that emotional connection between you and your characters, it’s about drawing threads of experience from your life and feeding it into theirs. It’s a powerful way of giving them life. You don’t have to, obviously, because the first rule of writing is that there are no rules!! But try it, it might work for you too! A million things, and that’s only a slight exaggeration! It’s one of my downfalls as a writer, I think, I just keep starting new things. But top of the list are a new middle grade horror series, a stand-alone middle grade horror, a choose-your-own-adventure spin-off for my series Escape From Furnace, and a brand new fantasy horror I started last week for Nanowrimo. Whether any of them see the light of day is another question, but I just love to write! 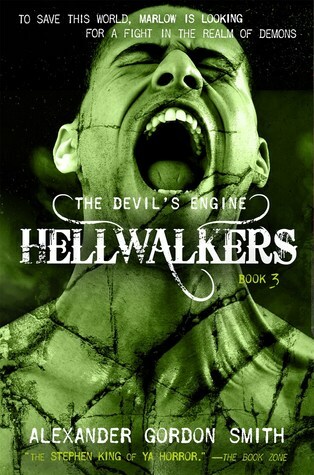 Have you had a chance to read THE DEVIL'S ENGINE: HELLWALKERS yet? I love that Alexander believes ALL of our stories are essential. What have you learned from your current project? What emotion have you tried to convey in a project that never seems right? What experience can you base it on?